Calculating Ucas points based on predicted grades - Which? Here on Which? University you can search for courses based on the Ucas entry points you’re predicted to achieve. Find out how to calculate your points with our handy tables. You can search for courses on Which? University based on your Ucas entry points score — but what are these? And why do universities keep going on about them? 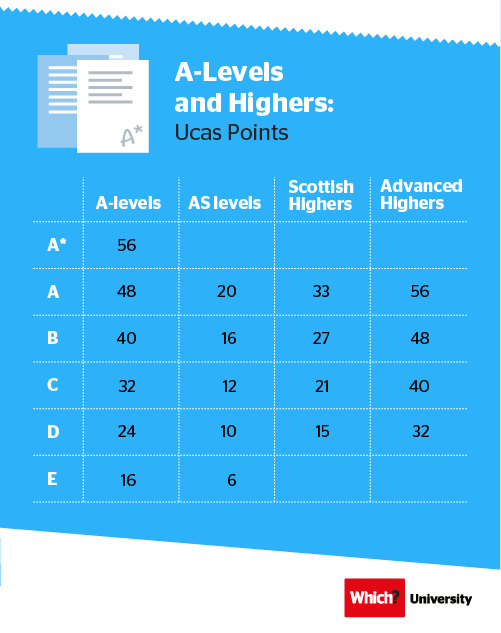 Ucas has a points system so it can compare different qualifications as a means of calculating whether students satisfy the grade requirements to get onto a particular university course. When researching university course options, you'll see something about the Ucas points required for that course when entry requirements are listed; or when a university comes back to you with an offer, it will say how many Ucas points you need. This is another way of communicating the grade requirements (eg. ABB) for that course, rather than additional criteria you have to satisfy. How many Ucas points do I need? If you know your predicted grades (or you can guess), you can calculate your Ucas points here for each of your A-level, Higher or BTEC courses. Add them up to find out how many Ucas points you'll obtain. This total is what universities will look for when they set entry requirements and make you an offer. What is a BTEC? A BTEC (Business and Technology Education Council) is a hands-on qualification as opposed to theory-based learning. It’s commonly known as an alternative to A-Levels. Are you an international student? 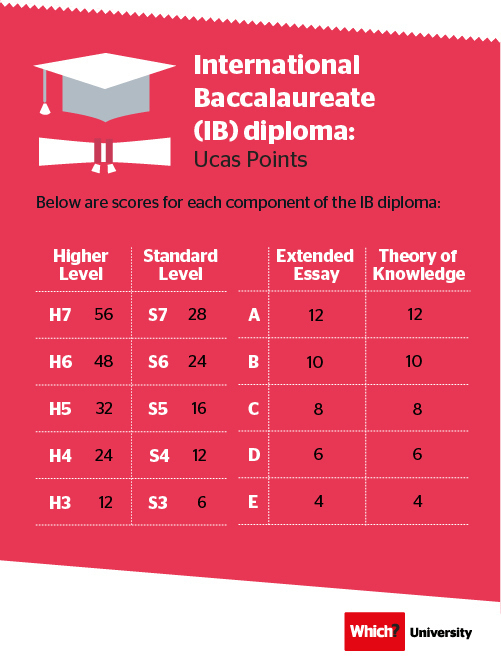 The International Baccalaureate (IB) Diploma itself does not attract Ucas points but the components which make it up do. 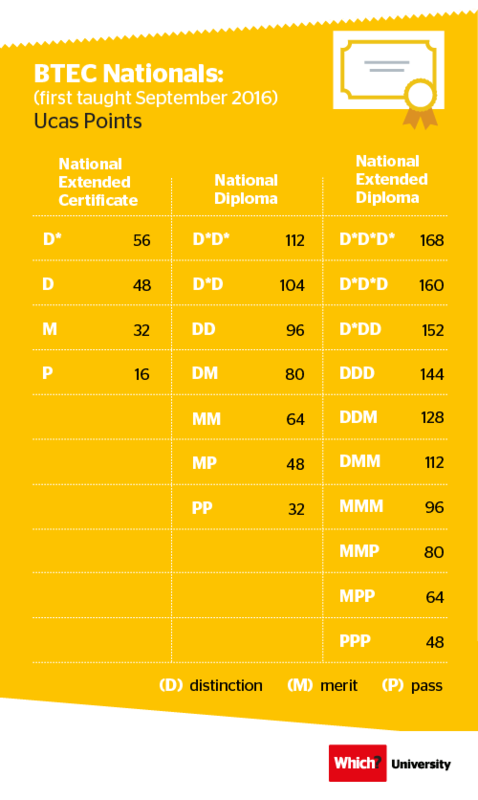 To achieve the IB Diploma, you have to pass each component and achieve a total IB point score of 24 or more. An EPQ (Extended Project Qualification) is worth half an A-Level (28 Ucas points), so can be a great way to boost your points. What is an EPQ and is it right for me? If you can’t find the qualifications you’re taking listed here (there are countless qualifications you can take to get into university! ), head to the Ucas website to see them listed out, along with their equivalent tariff points. You should always check the specific entry requirement details listed for each university course. Some courses don’t list Ucas tariff points but only consider grades or scores from a much more limited set of qualifications such as A-levels, Highers or the International Baccalaureate (IB). Find more help and advice on the Ucas website.